I’m sure you’ve all been hearing a lot in the news regarding the latest Facebook privacy controversy, however we have some other interesting news in social media we would like share. Every year, the social media world changes. That’s no exception for 2018. 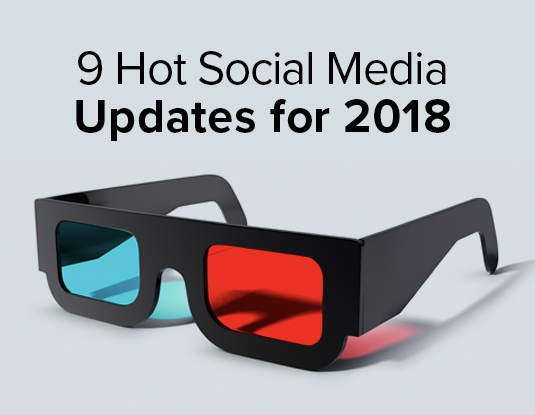 So, if you want to know how your business can capitalize on these current trends, here are 9 new things you should know about in social media. Three-dimensional posts are popping up in Facebook news feeds everywhere. Interactive 360-degree photos, augmented reality, and virtual reality are a big hit as they create more immersive experiences. Facebook was dealt another big privacy blow when a Belgian court ordered the company to stop tracking Belgian citizens’ online habits, and delete all data it holds on them, or risk paying a €100 million fine. Last year, Facebook launched Community Help so users could offer help during natural disasters, terror attacks, and other catastrophes. Now businesses can pitch in as well in a socially responsible way. Facebook recently revealed a startling message about their algorithm. It’s no longer driven by likes and frequent posting. Shares are now king, so brands must now create imaginative, “shareable” interactions. LinkedIn will soon introduce its Salary Insights, presenting members with estimated compensation ranges for the job positions they come across. Now users can leverage those insights when interviewing. Snapchat is introducing GIF stickers so users can add GIFs from its new Giphy library to their snaps and stories. The GIFs, along with Snapchat’s animated stickers, give users more creative options than ever. Marketers have discovered the popularity of Instagram Stories—the company’s take on Snapchat’s Stories—and are now using it to tell brand stories, strengthen CTAs, and generate new traffic and leads. Instagrammers now have a feature that copies Snapchat, but goes further, by letting them control whether private message recipients can view photos and videos once, get a second glance, or keep them forever. Instagram is providing more tools and guidance—for location hashtags, co-opting unique hashtags, and creating branded hashtag campaigns—so businesses can get the most out of their hashtaggery. Based on #SocialSkim: Facebook 3D Posts Are Coming; LinkedIn Salary Insights: 10 Stories This Week by Christian Neri.